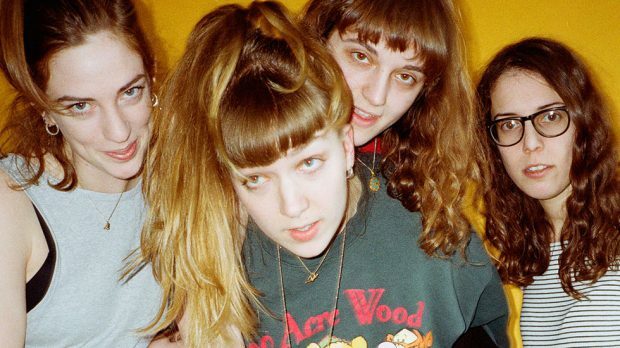 London’s all female quartet The Big Moon have been making quite a splash over the past year with a swag of well received singles. CHRIS HAVERCROFT spoke to bass player Celia Archer about the band’s busy schedule and the release of their debut album Love In The 4th Dimension in April. Since forming in 2014, The Big Moon have gone from learning how to flesh out the songs of Juliette Jackson, to becoming a bona fide outfit with offers of gigs and recording contracts. Their first five singles came at a rate of knots and got airplay worldwide. It is this whirlwind success that finds Archer feeling a bit under the weather following their trip to the USA which included gigs and South By South West. “I think I may have been pushing it too hard and my body is responding in all sorts of horrible ways,” concedes Archer of the rigours of life on the road. “I have maybe learned my lesson, but I am not sure. SXSW is definitely an endurance test. It is like a marathon for bands and we certainly made it like that by playing 12 shows. The members of The Big Moon didn’t know each other before they started playing music together. Juliette Jackson started writing some songs, and the band members all found each other through various degrees of separation. Some of the songs on the album were written before they even knew each other, but all were committed to bringing life to the songs and the world that Jackson was creating. “I imagine if you grow up with people and play music together then eventually somebody has to take control,” she says. “Are you really going to let your mate from primary school tell you what to do? I can see how that would create tension. The way that our dynamic is as a band isn’t normal but it works really well for us. For the recording of Love In The 4th Dimension, The Big Moon were aided by producer Catherine Marks (Foals, Wolf Alice). Archer says that the quartet weren’t sure of what a producer would bring to their sound but says that Marks was able to draw a performance out of The Big Moon without the group even knowing it and managed to make it all “delicious” at the end of the day.